Written around autumn 2001, lili_Pad was created to help me keep a diary of my work placement year at university, and since then it served me well as a general styled text multi-page notepad. 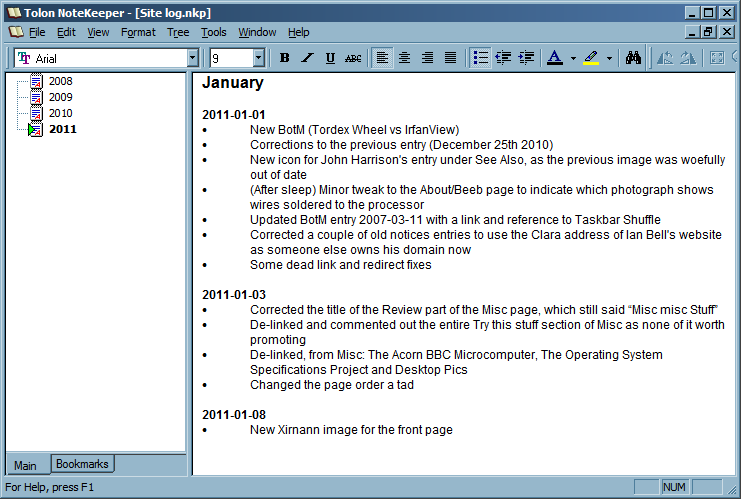 Over its lifetime, I extended the original rudimentary program with simple features such as find within topic, find across all topics, a draggable pane divider, coloured text and the ability to remember the window size, pane width and last note in use for each document. Undo was never implemented due to the limitations of the framework with which it was written. Notekeeper, of course, has undo. 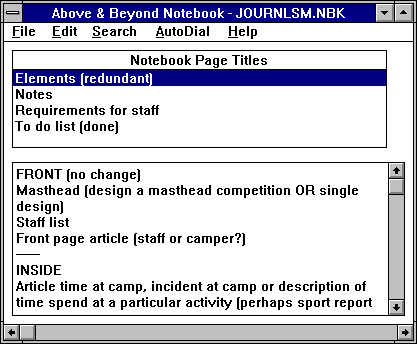 I soon deleted Above & Beyond but kept hold of Notebook as it was so useful. 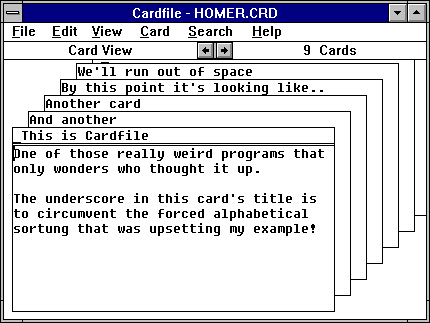 It was pretty much functionally equivalent to Cardfile, but with a better user interface. Notes were not limited in capacity like Cardfile or, at least, not to the same degree. Styled text was not supported, nor were note categories. Support for inserting images was again provided, but it was just as strange in implementation as its predecessor. Whatever this mysterious program was, however, it was another stepping stone on the way to lili_Pad itself. Before Stonehenge, there was Strawhenge, and Woodhenge. And MultiPad. lili_Pad was conceived sometime in autumn 2001, before I started my placement year at university. While rooting around on my old Zip discs, I came across another program, called MultiPad. The last-modified date on the source code file is December 2000, so it predates lili_Pad. MultiPad was never completed; in fact, MultiPad appears to do just about nothing. But it has several noteworthy aspects. 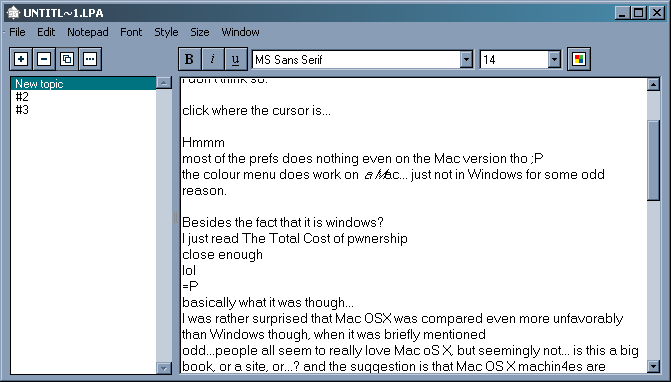 Firstly, as you can see, it was intended to support categories, rather like the Memo pad on the Palm Pilot. 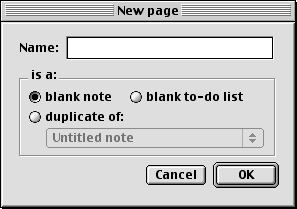 It was also intended to support to-do lists, although I have no idea how I planned to achieve that in REALbasic at the time. On the other hand (and I would have to plug my Zip drive back in to check) it appears not to support styled text, which was one of the important features of lili_Pad. What you may have noticed is that the graphics for the toolbar buttons are identical in both programs, so clearly I must have based one on the other to some degree. 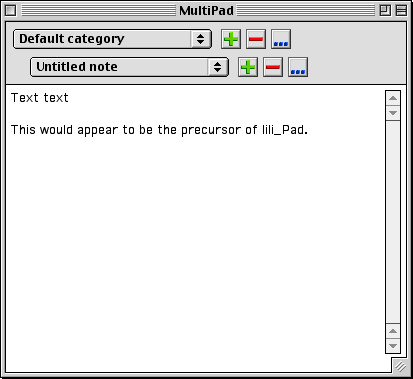 The irony is that I have zero recollection of MultiPad having ever existed, or why I chose to completely redesign the interface for lili_Pad. At one point, I attempted to port lili_Pad to Windows. I made a little bit of progress, but it was terribly unstable. 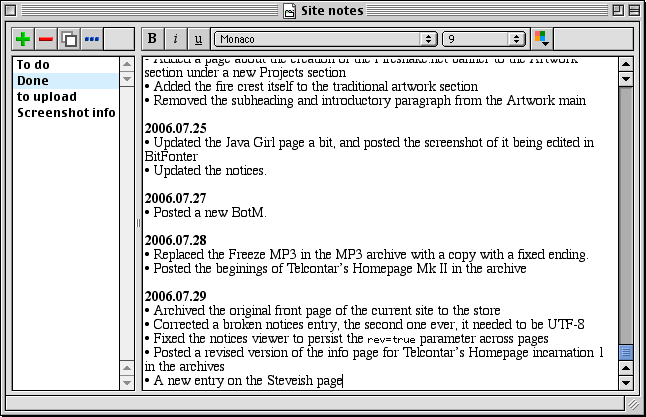 I lost the source code to this version in 2004, but with much better libraries to hand, I could have subsequently rebuilt it and made it work, although text formatting would have remained platform specific. There was never any call for it, and NoteKeeper serves my needs adquately and has far more features than I would have been able to implement with the restrictive framework I used. 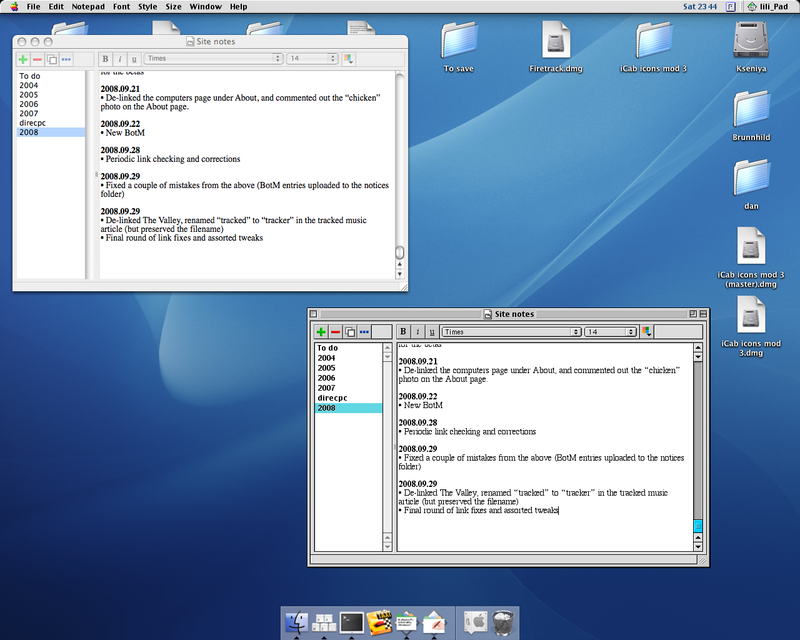 In the screenshot above, I was demonstrating lili_Pad to FireSnake over VNC and it was serving as a makeshift chat program. lili_Pad was a humourous throwaway suggestion by version_lili when I was looking for a name for the originally nameless application. She protested about it, but that was in vain as the name was perfect and I kept it.